River island of Majuli in midstream of Brahmaputra River in Assam is part of the Tentative list of India in order to qualify for inclusion in the World Heritage List. Poor Majuli! Referred in 2006, deferred in 2008 and then, in 2012, not examined at all because the dossier was incomplete! Will it ever get that inscription? To try to discover more about this site, we went out of our way to visit it whilst we were in Assam in 2013. The Island of Majuli is sometimes claimed to be the largest riverine island in the world. Whatever – it is big and is set a 1+ hour ferry ride north across the Brahmaputra from the ferry point at Neematighat some 15kms north of Jorhat. I say “1+” hour because the exact timing is variable depending on the state of water levels and of the shifting islands and, as Google searches discover, it isn’t unknown for the ferry to get stuck for hours! The ferry ride is an “experience” on what is known as a “country boat”. This is of traditional wooden design and is vastly overloaded with hundreds of passengers, a quarter of whom seem to have motor cycles, goods of every sort from chickens up to exceedingly heavy mechanical equipment , and, oh yes, our car and 1 other with their fronts and rears hanging over both sides of the boat as their wheels “grasped” the final inches of available deck! A list of ferry prices displayed at the ghat was particularly amusing – these included “Wild animal like tiger, lion etc. Each 82 Rupees” and “Elephant with Mahout. Each 821 Rupees”. My photo of this price list is now one of my prize souvenirs of the trip. I have to report that no one (to my knowledge) tried to board with a tiger, lion or elephant – though the weight of the latter would, I fear have proven too great, whilst a tiger could have led to a “Life of Pi” situation! On arrival it is hard to distinguish the “island” from the many sandbars you will have passed and everywhere there are flimsy “porcupine” structures designed to try to slow down the river and minimize further erosion but, eventually the sandy path from the ghat rises a little and one is on “terra firma”. In all its reviews ICOMOS complains about the impact of erosion and recommends an appraisal of factors causing the problem in order to identify possible actions. This seems a forlorn hope. Majuli only became an island in an earlier “rearrangement” of the Brahmaputra around 400 years ago. What the mighty Brahamaputra gives it also takes away, both eroding and depositing along its length. If Majuli’s inscription depends on India preventing such erosion then it might as well give up now! Upstream developments may have worsened the problem but the people of Majuli have “always” lived with it, and the Satras, the Hindu monasteries which make Majuli “special” have all been moved due to floods and erosion on numerous occasions since their founding across the last 300 years. In earlier days this was relatively easily achieved without compromising their integrity but, more recently, such reconstruction has involved the introduction of modern materials and any future moves would be likely to follow this trend – another worry for ICOMOS! So, what of the Satras (or “Sattras”)? There are said to be 31 on the island of which 6 were documented in 2008 after ICOMOS had complained in 2006 of a complete lack of descriptions! In 1 day we visited 4 of those 6 as follows (with original founding dates, though, as stated above, the founding dates are not particularly relevant to the architectural merit of the institutions). Natun Kamalabari (1903), Uttar Kamalabari (1673), Garamur (1650) and Auniati (1653). These satras trace their origin to a 15/16th century Vaishnavite (= follower of Vishnu) saint called Sankardeva (he lived supposedly for 120 years!) who developed a form of Hinduism which particularly took root in Assam. The “religion” he founded is monotheistic and called Ekasarana Dharma. Satras are its socio-religious organization. Each Satra has slightly different traditions, so some monks are celibate and others are married. The Satras, however, operate beyond a purely “monkish” role. I still struggle with the concepts, but a couple of quotes from the 2008 ICOMOS evaluation might be of help - “The Sattras have shaped the socio-cultural life of the whole island through a symbiotic relationship between the residents of the Sattras and the villagers” and “The Sattras as institutions continue to impart spiritual knowledge and to propagate art and culture: they exercise spiritual control over communities which has over several centuries helped to maintain social order, peace and harmony”. If you want to know more you will have to do your own investigation!! But the above does bring out an important aspect of the Satra – namely its role in artistic life via dance, music, drama and even art in the form of masks (of which we saw some very fine examples at Natun satra). A satra consists primarily of single story living accommodation or “hati” in the form of a square which surrounds a prayer hall or “Namghar”. Our visits consisted first of passing the entrance gate or “Batkora” where shoes had to be removed (and there is a lot of stoney walking thereafter!) followed by a chance to enter the living accommodation and speak to a few monks – surprisingly not always via an interpreter (see later), followed by a visit to the Namghar (photo). 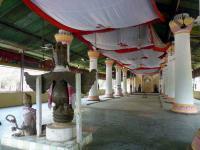 ICOMOS says of these - “The Namghar, where periodically people gather to sing, dance and pray is more than a temple - it is a meeting place or village parliament as well where decisions are made on matters concerning the village – such as fishing rights or what to do with the money that the Sattra has raised”. Those we saw had some decoration and carvings in the main hall and an inner sanctum or Manikut (= jewel hut”) for the idols and other important articles. Unfortunately the daily morning prayers are at 8.30 and, as I was unaware of this until after we had made our plans, we had to leave on the ferry back before they took place – very annoying!! We did however see a practice dance/drama session by young performers at Auniati. This consisted of a very complex series of exactly choreographed movements with yoga like poses to a simple beat of drum and cymbal – interesting but really somewhat unintelligible in the short time we had, despite having a monk as a guide. As for the “architectural merit” of the buildings – well, at the risk of being accused of being limited in my concept of “architectural value” I would suggest that most were pretty “low” with corrugated iron roofs and low grade concrete pillars. During our visit we discovered that Majuli has something of a “cult” status among both sociologists and those seeking a new religious path. So, at our hotel, were a couple spending over a week on the island studying the way of life of the villages and Satras. And a 2011 movie titled “In search of God” is described as “The transformative journey of an American woman who finds deeper meaning in her life after traveling to a mystical island in India where the inhabitants use artistic expression as a means for communing with God.” (You have been warned!) We met the young monk who had been “catapaulted to stardom” in the movie and found him to be a very personable and well educated young man with excellent English – so the education in the Satras does cover more than religion and artistic expression! It appears that young monks are “given” to the Satras by their families but (in theory at least) are able to decide to leave – but most stay for life. India originally nominated Majuli complete with Satras, villages, fields etc, claiming that these were all linked. ICOMOS however concluded that “What has also now become clear from the supplementary information provided is that the Sattras have not influenced the disposition of settlements and fields, or the whole spatial arrangement of the landscape and farming practices”. Instead it suggests that only some of the Satras should be nominated as a core zone - those which, following a proper inventory, “might have the potential to demonstrate outstanding universal value”…..“with the wider agricultural landscape of the whole island being considered as a buffer zone.” My general feeling is that it is going to be very difficult for India to set up the place properly and make a viable case. Majuli’s merits might be better represented via the “Intangible Heritage” route. last month i have been to Majuli with my family before visit i was not aware about this island and when my father told me about this island i was very excited to see this island cause i have been to islands of sea but not of a River. so i went there and found that island absolutely awsome. everything near by so green so healthy nearby we can see river and greenry around and best part waking up in the morning actually i felt there 4:15 and sun is there in front of us. I have been to different satras of the Island i met the family who preparaes mukhote and they also perform during ocassions. the lifestyle of people there is just so simple and so sweet. we stayed at assam tourism resort which was built in Majuli style which was one of the beautiful architecture and also our cook in resort he was thye best one cause whateverwe ordered he prepared and that was tasting like we are at some high class restraunt and the way they served the food was so lovely as there was a small problem of electricity which is completely acceptable so me and my family we had candle light dinner. what else to say about to be in Majuli we stayed there only arnd 24 hours but we wanted to stay for more but as we were lacking with time so said bye bye to majuli but we promised ourself that we will be back soon.